Williams was there for the Chargers on a 19-yard reverse touchdown run in the third quarter to keep the game close. Williams was there in the corner of the end zone for a touchdown catch with just four seconds left in the fourth quarter. And Williams was there — and inexplicably wide open — to secure the game-winning two-point conversion moments later. Los Angeles overcame a sluggish start and inconsistency from quarterback Philip Rivers to get there. Kansas City picked off Rivers’ first pass of the contest and jumped ahead 14-0 behind two touchdowns throws by Patrick Mahomes. Rivers was picked off again just before halftime in the red zone. 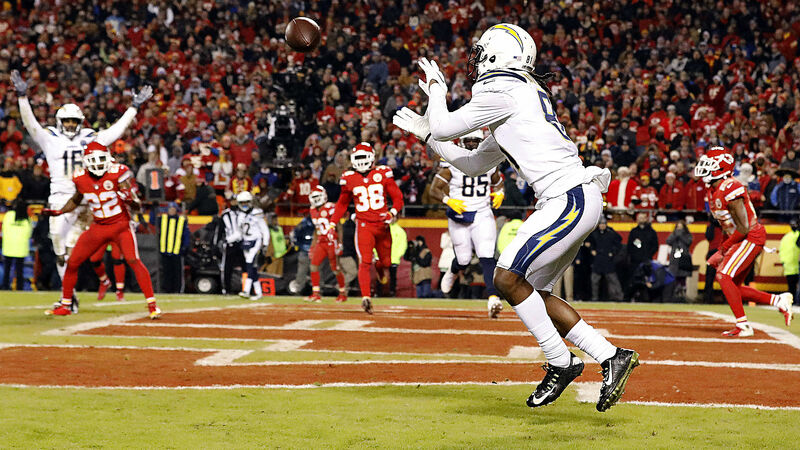 But the Chargers’ defense held Mahomes mostly in check in the second half, and Rivers and Williams combined to lead the comeback victory. Los Angeles has now won four games in a row and 10 of 11 overall. It clinched a playoff berth with the win. 11:27 p.m. — TOUCHDOWN, Chargers. Rivers hits Mike Williams for the score. 11:30:TWO-POINT CONVERSION, Chargers. Mike Williams is wide open to haul in what should be the game-winner. 29-28, Chargers. 11:25 p.m. — Huh. A late pass interference call goes against the Chiefs, and now the Chargers are at the 1-yard line. 11:23 p.m. — What looked like a late hit on Rivers isn’t called. Thirteen more seconds. 11:21 p.m. — Rivers to Benjamin again, this time on fourth down for a key conversion. There is less than a minute left. 11:16 p.m. — Rivers hits Benjamin with a perfect deep ball across the middle. The Chargers are inside the Kansas City 40-yard line. 11:13 p.m. — Los Angeles gets the ball back with 2:37 remaining in the fourth quarter. 11:06 p.m. — TOUCHDOWN, Chargers. Justin Jackson cuts the deficit in half. 28-21, Chiefs. 11:05 p.m. — The Chiefs hold Tyrell Williams on fourth-and-3 inside the 10. That’s an automatic first down. 10:54 p.m. — TOUCHDOWN, Chiefs. Damien Williams scores again. 28-14, Chiefs. 10:45 p.m. — Kansas City is now inside the 30. 10:41 p.m. — Two defensive penalties against the Chargers and a catch over the middle by Kelce has Kansas City in position to make this a two-score game. 10:30 p.m. — The Chargers don’t do anything with the opportunity, however, and Rivers almost throws a third interception. 10:21 p.m. — Los Angeles gets a stop. It’ll have a chance to tie the game following a Chiefs punt. 10:14 p.m. — TOUCHDOWN, Chargers. Mike Williams scores on a wide receiver reverse. 21-14, Chiefs. 10:02 p.m. — TOUCHDOWN, Chiefs. Damien Williams runs it in. 21-7, Chiefs. 10 p.m. — Tyreek Hill makes a leaping 33-yard catch. 9:57 p.m. — The second half is underway. 9:35 p.m. — Interception. Rivers tosses his second pick of the game, this time in the red zone. 9:30 p.m. — Wide receiver Keenan Allen is in the medical tent with an injured hip. 9:23 p.m. — Los Angeles is past the 50 with about three minutes remaining in the half. 9:15 p.m. — The Chargers force a punt. That was a big stop given the field position. 9:13 p.m. — Kansas City returns the ensuing kickoff into Chargers territory. 9:09 p.m. — TOUCHDOWN, Chargers. Mike Williams helps Los Angeles back into the game. That’s his eighth touchdown catch of the year. 14-7, Chiefs.
. @darealmike_dub ‘s GOT HOPS. 8:53 p.m. — TOUCHDOWN, Chiefs. A late-developing screen pass gets Kansas City into the end zone. 14-0, Chiefs. 8:42 p.m. — Los Angeles punts. Mahomes can add to the Chiefs’ lead here. 8:32 p.m. — TOUCHDOWN, Chiefs. Mahomes makes another sublime throw. 7-0, Chiefs. 8:28 p.m. — Mahomes makes an incredible third-down throw rolling out of the pocket. 8:24 p.m. — Interception. Rivers underthrows a deep ball and it’s picked off. 8:22 p.m. — Kickoff. Los Angeles gets the ball first. 7:40 p.m. — The Chargers are excited for this one. “Y’all know what time it is, baby.” 🗣 @DerwinJames has the @Chargers ready for prime time! 7:30 p.m. — Here are the inactives for each team.